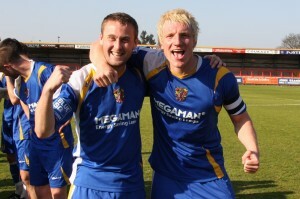 In the League, the wait for promotion to the Football League came to an end with Stevenage Borough finally emulating the team of 1995/1996 by winning the Football Conference in the guise of The Blue Square Premier League and in doing so earning promotion to the Football League for the first time in their history. The start of the championship winning campaign was distinctly average, with a 1-1 home draw against Tamworth. The uninspiring start to the season continued with two consecutive draws on the road 1-1 and 0-0 against Hayes and Yeading and Barrow respectively. Late August/ early September saw Boro really get into their stride and go on a five game winning run in the league beating Rushden (2-1), and Eastbourne (2-0) at the Lamex and Histon (0-2), Mansfield (2-3) and Chester (0-1) on the road. (The Chester result was later expunged due to Chester’s inability to finish the league season). A famous 0-1 victory at Kenilworth road, courtesy of Scott Laird, ensured that the month of September finished on an impressive and morale boosting note. Boro continued to impress during the autumn and the early winter with key victories at home against Hayes and Yeading (4-0), Salisbury (3-1), Gateshead (5-3), Chester (2-0) and Kidderminster Harriers (2-0). This was supplemented with away victories against Forest Green and Salisbury (both 0-1) in the same period. The traditional festive double header saw Boro facing Cambridge United, with Boro convincingly winning both games 1-3 on the road on Boxing Day with the New Year starting in emphatic fashion with a 4-1 win on the first day of 2010. In late January an incredible run started with Boro winning 14 out of a possible 16 league fixtures, with the only defeats in that period being against fellow title challengers Luton Town in front of 7,024 supporters at the Lamex (0-1) and Rushden and Diamonds at Nene Park by the same score line. It would be amiss of me, in the light of recent events not to mention a cracking quick fire hat-trick by substitute Mitchell Cole away to Eastbourne Borough in this period. For the record Boro won that game 0-6. This fine form set up a chance for Boro to confirm the championship and promotion to the Football League for the first time in their history. On 17th April 2010, Boro travelled to Aggborough, with their destiny in their own hands. A famous 0-2 victory courtesy of a Charlie Griffin free kick, which needed to be taken twice due to an infringement, and a Joel Byrom solo effort, was enough to ensure the three points and the coveted promotion place. After the final whistle the tension of the season was released with a friendly pitch invasion by the travelling Boro fans, followed by Graham Westley individually introducing the players to the celebrating supporters. 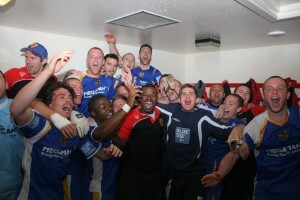 The magnitude of what the team had achieved was not lost on the players with them celebrating with the “destiny will always take over” banner – created and donated to the Boro supporters by supporters of near neighbours Barnet FC years before. Everyone will have memories of that day, the Charlie Griffin goal that settled the nerves, the Joel Byrom strike that brought so much relief and emotion, the celebrations by both the supporters and players, Phil Wallace walking around with a fan produced replica of the Conference Trophy and of course the drive home as champions! The 17th April 2010 is such a significant point in history for the club – supporters who couldn’t make the trip to Kidderminster will always remember what they were doing that day or where they were listening to the match. 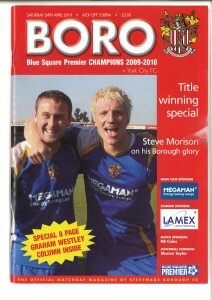 Boro still had two matches to complete the Blue Square Premier season and did so with another two wins, a 0-1 victory at Gateshead and a home victory against York City by the same score line. After the York game, the captain Mark Roberts received the Conference Trophy in front of just over 5,000 celebrating Boro fans. Great scenes of celebration ensued with the realisation that Boro had finally made the step up from the non league elite. This was not to be the end of the season though as Boro had a date with Barrow in the FA Trophy final a couple of weeks later. Doing the double win over….. Note: Win double over Chester City also achieved but results expunged due to Chester City being unable to complete the season. In the FA Cup, Boro were knocked out of the competition at the first round losing 0-1 at the Lamex to League 2 opposition Port Vale. The original tie at Vale Park ended 1-1 with Charlie Griffin grabbing a well deserved equaliser in time added on at the end of the game. Boro did beat Chelmsford City 1-2 away in the 4th qualifying round with that man Charlie Griffin and Peter Vincenti on the mark for Stevenage that day. 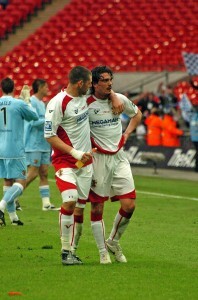 In the FA Trophy, Boro emulated their success of the previous season by making the final at Wembley, although unlike the previous season they did not manage to lift the Trophy, losing the final to Barrow 1-2 after extra time in what was at times a bad tempered encounter that saw David Bridges sent off midway through the first half and Charlie Griffin having to leave the field of play with a horrific facial injury sustained following a “challenge” by Robin Hulbert. Hulbert saw a straight red for the challenge but this was little recompense as Boro had to face the whole of extra time ( after the regulation 90 minutes ended 1-1) with 9 men as they could not replace Griffin as they has already utilised all their subs. Boro could not beat the odds and hold out for a penalty shoot out conceding the goal which prevented them completing the league and cup double in the 107th minute. It could and probably should have been so different, especially after Andy Drury had given Boro such as spectacular lead in the game. The road to Wembley was impressive though with convincing wins in every round. 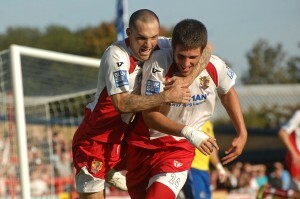 Round 1 saw Boro beat Ebbsfleet United 2-0 at the Lamex with David Bridges and Chris Beardsley finding the net that day. Vauxhall Motors were thumped 6-0 at the Lamex in Round 2 with David Bridges (2), Mark Roberts, Andy Drury, Stacy Long and Lee Boylan inflicting the pain on the Ellesmere Port outfit. Another impressive display in Round 3, again at the Lamex saw Boro despatch Dover Athletic 4-1 with Tim Sills, Chris Beardsley, Michael Bostwick and Yemi Odubade seeing Boro convincing through. 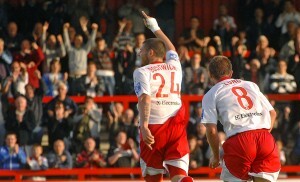 The quarter finals, again at the Lamex, saw Stacy Long grab a brace to see Boro ease past Workington 2-1. This set up a semi final double header against Kidderminster which saw Boro safely through to the final 5-1 on aggregate. All the damage was done in the 1st leg at Aggborough with Boro running out 5-1 winners. David Bridges and Chris Beardsley helped themselves to a brace each, with Yemi Odubade completing the rout. The home tie was very tame in comparison with the game ending 0-0 – although this mattered not as Boro had reached Wembley once again. Images of the Kidderminster celebrations supplied by The Comet and reproduced with the kind permission of Matt Ranson, the copyright owner.